Today we're taking a look at Excelta Cutters and some of their features such as cut type, grip, and head shape. Excelta Cutters are available in many different combinations of these options as well as lengths and materials. 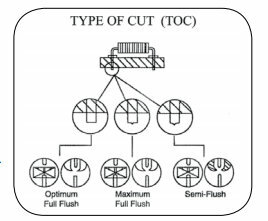 Cut type is determined by the out side angle of the cutting blades. The three different options are semi-flush, maximum flush, and optimum flush. The cutting blades are at a 45 degree angle with a .010 inch bevel, a 45 degree angle with a .005 inch bevel on a maximum flush cutter, and finally the cutting edges are completely out with no bevel on an optimum flush cutter. The main consideration when choosing what cut type is best for you would be the needs of the application and longevity. A semi-flush cutter will last the longest and be able to complete a greater amount of cuts then both the maximum flush and optimum flush. Optimum flush produces the least amount of total cuts. The Three different handle grips available from Excelta on their cutters are molded grips, double-dip grips, and foam cushion grips. All of these grip types are static dissipative. Round head shape is the most common head shape due to the fact that their is more metal behind each cut made. This adds to the longevity of the tool and overall durability. Excelta Rounded Head Cutters are available in small round, medium round, and medium tapered also known as relieved head cutter sizes. 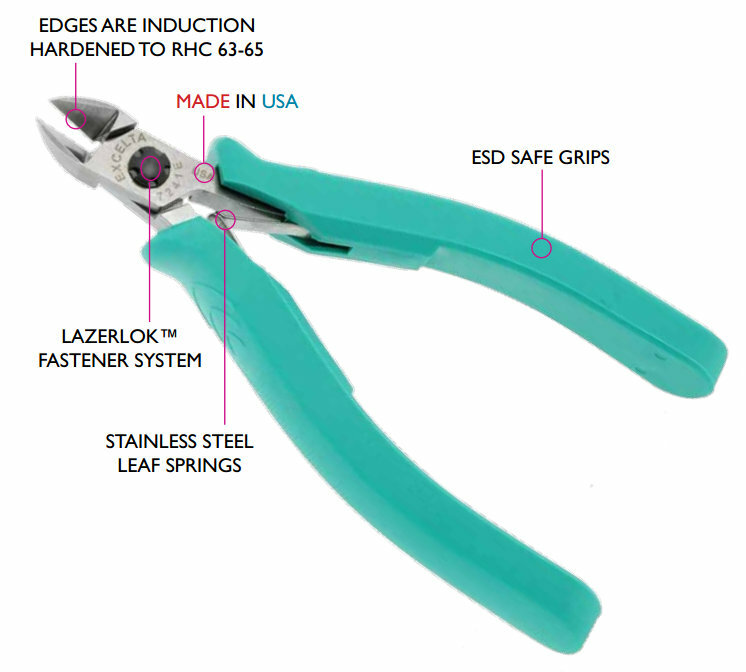 These cutters use the most advanced CNC machining and have induction hardened to 63-65 RHC to produce the best cutter available on the market. Now these cutters have a safety wire catch option. This feature allows the the cutter to cut and hold the lead. This feature helps prevent injury in the work place and has the suffix "-W" on the end of the part number. Janel supplies every Excelta Cutter available online - click here for more information.